Noemie Goudal Well, 2011 Lambda Print 170 x 210 cm./111 x 137 cm. 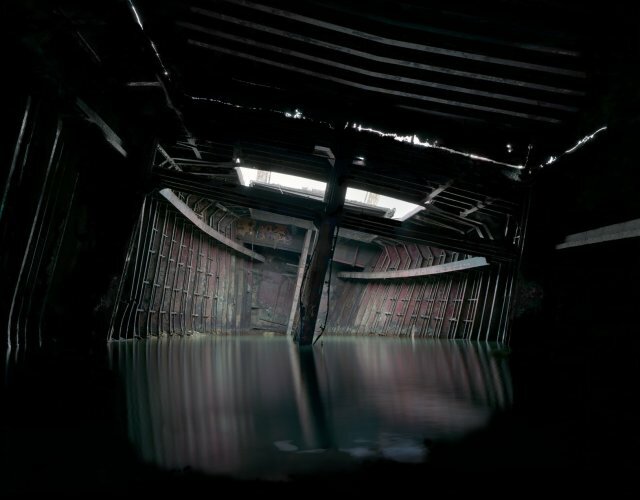 The Prix HSBC pour la Photographie Executive Committee elected Cerise Doucède and Noémie Goudal prize winners of the 2013 competition from the 10 finalists chosen by Emmanuelle de l'Ecotais, artistic advisor. Since 1995, the Prix HSBC pour la Photographie aims to support for the emerging generation of photographers. The two prize winners are accompanied and supported through the publication of their first monograph in collaboration with the publisher Actes Sud and through the organisation of a temporary exhibition of their work in four reputed cultural places. This year, the exhibition will begin at the Galerie Seine 51 in Paris on May 16, 2013. Noémie Goudal builds installations in open and closed locations both, but in ones that always lack perspective. She uses industrial material (plastic, paper, cardboard, fabric) or photographs printed on kevels and hung in the environment. She transforms caves, disused factories, forests and endless seas, into strange theatre settings where anything can play out, even the most absurd of scenes. She creates fragmented windows that open onto an outdoors that appears fabricated and fragile, likely to disappear with the slightest puff of wind. All of these fictional places provide numerous levels of interpretation: man's relationship with nature and the organic world, the fragility of each us, our impact on one another, etc. The viewer is thus drawn to invest in these places and place themselves in a story (for example in Promenade, the lovers can escape the enclosed space of the barn and cross the bridge), each image offers a home to each of our imaginations.